While many people choose to make their bathrooms more eco-friendly by installing more efficient faucets, shower heads and toilets - as well as using energy-efficient lighting options - design experts say many bathroom vanities can make a space even "greener." Several manufacturers have released bathroom furniture lines that are constructed using environmentally-friendly, zero emissions woods and veneers as well as low V.O.C. finishes. Many also use Forest Stewardship Council (FSC) certified wood. 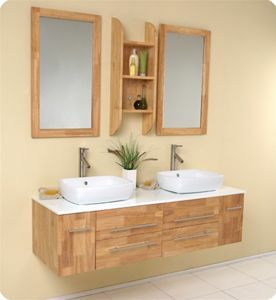 In addition, these eco-friendly bathroom vanities are constructed without the use of hazardous resins, epoxies and glues. According to WorldInteriorDesignNetwork.com, some manufacturers are also offering more environmentally-conscious materials for vanity tops, including Caesarstone and Vetrazzo. Caesarstone reuses and recycles manufacturing wastes including quartz, glass and mirrors for their surfaces, thereby reducing the amount of waste generated. Vetrazzo is a recycled glass surface comprised of 100 percent recycled glass. Consumers can also rest assured knowing that choosing an eco-friendly bathroom vanity won't mean they have to sacrifice style or durability. These lines are built to last and are available in beautiful, stylish designs that can be incorporated into any bathroom space.